Nathan Kadish ’09 arrived at Kellogg looking for tools to effect change. After five years as a grass-roots organizer for Stand for Children, a national organization dedicated to improving education and health care for kids, Kadish was eager to grow his skill set. As a Kellogg Board Fellow, Kadish dove into the business of running a nonprofit, serving on the national board of the YMCA. The position, coupled with classes on nonprofit board governance, gave Kadish a great vantage point to learn how leaders of a national organization think. Since the Kellogg Board Fellows was founded 10 years ago, nearly 500 participants have served on the boards of 172 different nonprofit organizations. 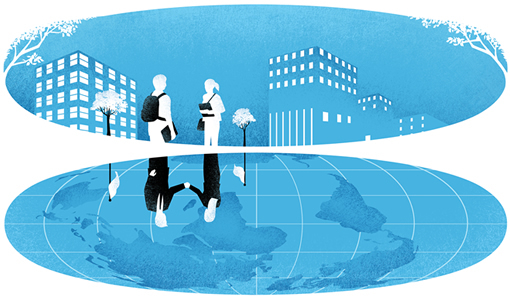 Founded by three MBA students and Anne Cohn Donnelly, a senior lecturer on social enterprise at Kellogg, the program enables fellows to participate as nonvoting board members on a nonprofit board, while taking complementary classes at Kellogg. The program was a logical extension of Kellogg’s existing offerings, says Liz Livingston Howard, a clinical associate professor of management and director of Nonprofit Executive Education. A student leadership team annually selects 50 fellows, and then matches each one with a local organization. The pool has become increasingly competitive. The 2013-14 academic year had 121 students apply, Fellows Program Director Sunny Russell says. Students take two academic courses taught by Don Haider, director of the Center for Nonprofit Management. The courses address critical nonprofit governance policies and procedures. As part of the classes, students meet with peers and faculty to discuss their board work. They also are required to do a project for their organization, such as identifying board governance best practices or studying marketing performance metrics. In return, the boards are expected to mentor students and allow them to participate as fully as possible in board activities. 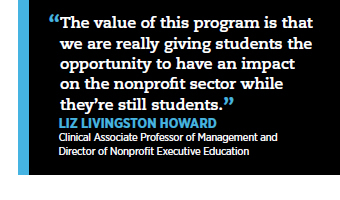 “The value of this program is that we are really giving students the opportunity to have an impact on the nonprofit sector while they’re still students,” Howard says. Adding business acumen to her board service is what attracted Debbie Marshall Merovitz ’05, manager at Deloitte Consulting, to the program’s inaugural cohort. Prior to Kellogg, Merovitz was a founding member of the Young Associates Board, a junior board of directors for the Gus Foundation, which raises money for pediatric brain tumor research and family support services at the Ann & Robert H. Lurie Children’s Hospital of Chicago. Kadish also took his board knowledge with him. After a short stint at Pricewaterhouse Coopers, he landed his dream job as director of investment strategy at Ecotrust, a social impact incubator that works with both for-profit and nonprofit groups that focus on the environment.